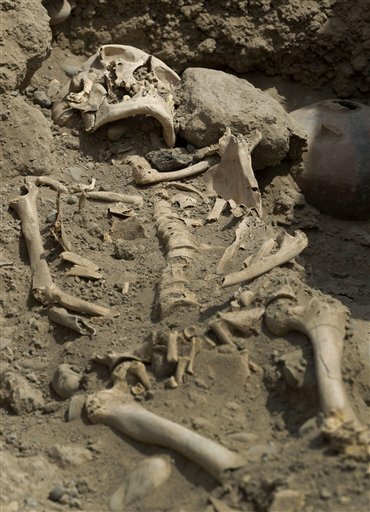 Archaeologists studying a small site at Peru's main sports center have dug up eight skeletons dating from at least 700 years ago and three others twice that old. 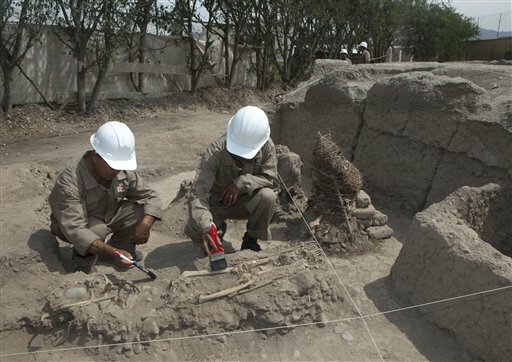 The discovery of pre-Hispanic remains was made at the Huaca Tupac Amaru B site at the National Sports Village. The 400-square-meter (yard) site sits just a few meters (feet) from the stadium where Peru's national soccer team trains. 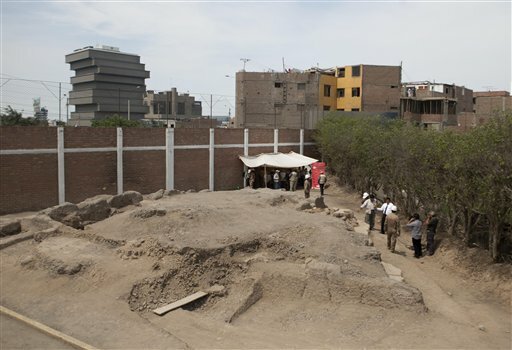 Archaeologist Fernando Herrera, head of the project, told The Associated Press on Tuesday that three sets of remains were determined to belong to the Lima culture, which developed between A.D. 200 and 700. 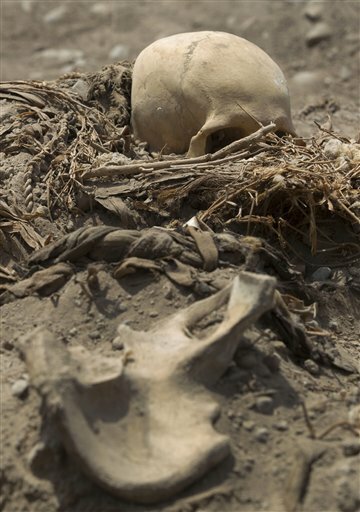 The eight other skeletons came from the more recent Yschma culture, between A.D. 1000 and 1400, he said. Each skeleton was found lying on a bed of woven reeds. The bodies were tied with braided rattan and covered by one or more cloths. 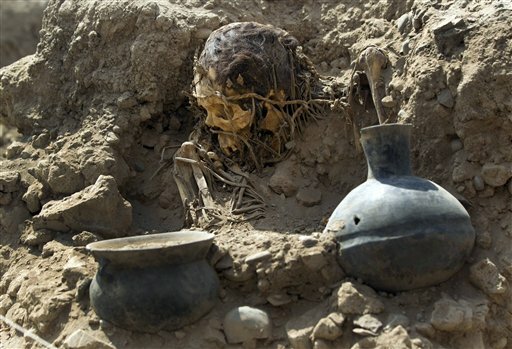 They were buried with ceramics, textiles, fruit tree leaves, and tools used for agriculture, he said. Herrera said the first skeleton was found in December and the others were recovered in January. The archaeological team thinks there may be more and is still searching the site, he said. There are many archaeological sites in Lima, including the Huaca Pucllana in the Miraflores residential district that has a towering Lima culture pyramid. Luis Felipa Villacorta, an archaeologist and historian who is director of the private Antonio Raimondi museum, said the find at the sports center will add to "the mosaic and image of the Lima culture that is very diffuse" compared to the Nazca and Moche civilizations that developed simultaneously in other parts of the coast of what is now Peru. Unfortunately not much is known of the Lima culture, he said, partly "because the city, the capital, has grown over it." In addition, there has been more interest in the "pre-Hispanic cultures that are outside the metropolitan area: the Moche, Nazca, Wari," he added.